Easy and Healthy Carrot Cake – no frosting required! I’ve found the world is divided into two groups – those who love pie and those who don’t. My family falls directly into the “don’t like pie” camp. Blasphemy at Thanksgiving, I know… but there you have it. So, what does one serve when “pie” isn’t an option? Cake!!! 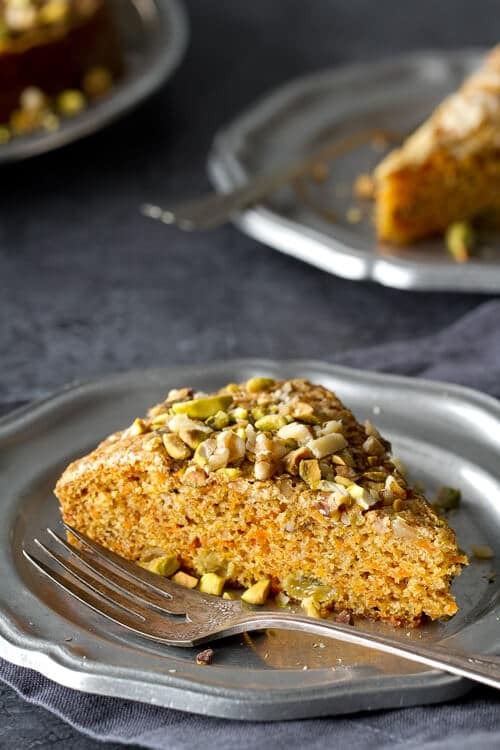 Especially if it’s this Easy and Healthy Carrot Cake! Which has the added benefit of being perfect for birthday candles – and since my youngest’s birthday is on Thanksgiving every few years dessert sometimes does double duty. The cake changes from year to year – one year it was this Bourbon Pumpkin Bundt Cake one and one year it was a lemon cake. This year though, it’s going to be this lusciously moist, incredibly Easy and Healthy Carrot Cake. Over the years I’ve made a number of different carrot cakes but this one is my favorite. 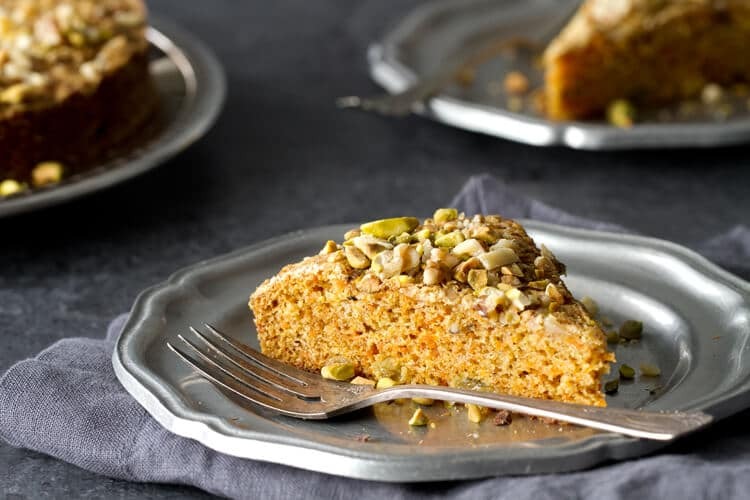 Flavored with cardamon and pistachios, it’s sweet and moist enough all on it’s own – no frosting required! And while I’ll be serving this for dessert, it would also make a great brunch cake. Suffice it to say this cake is good just about any time – especially when shared with family and friends. 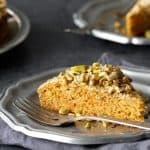 Slightly adapted from Madhur Jaffrey's Spice Kitchen, this Easy and Healthy Carrot Cake recipe is so moist, no frosting needed. 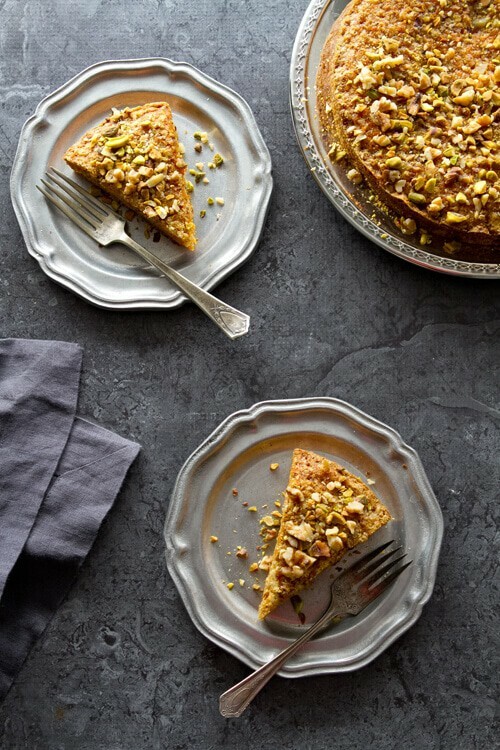 Cardamon and pistachios give an Indian twist to this luscious cake. Spray a 9 inch cake pan with cooking spray and dust lightly with 1 teaspoon flour, dumping out excess flour. Trace bottom of pan onto parchment paper and cut out circle. Place parchment circle in the bottom of the cake pan. Sift the flour, baking soda and salt together and set aside. In the bowl of a mixer add the eggs and beat until the whites and yolks are combined. Add the sugar, butter and spices and beat until thoroughly combined. Gently fold in the flour. When incorporated, stir in the carrots and 2 Tablespoons of the pistachios and 2 Tablespoons of the walnuts. Stir in the raisins. Sprinkle the top with the remaining chopped nuts. Bake for 35 - 40 minutes or until a toothpick inserted in the center comes out cleanly and the top of the cake is golden brown. Cake that is shaped like a pie is a clever compromise for those who don’t like pie. Looks delicious! This is gorgeous! I also love the plate. Where did you find it? I’ve been looking for a pewter plate. Hi Melanie!! Awww… thank you!!! I know the cake isn’t dripping with frosting but it honestly doesn’t need it – my students (college aged) absolutely loved it so that tells you something!! The plate is wilton ware – very popular in the 1970’s. I found these on Etsy – if you go to Etsy and google “wilton” you should come up with a number of items. But I warn you – it can be dangerous! I went looking for plates and ended up with a “few” other things as well. LOL!!!! I could easily enjoy a slice for breakfast, brunch, and brinner! I suppose dessert too haha! Loving this lovely cake recipe – thank you! Healthy carrot cake? Yum! I always tell myself that carrot cake is healthier anyway because well, carrots. But the cream cheese frosting kinda kills that idea, doesn’t it? Thanks for this easy and healthy verson!